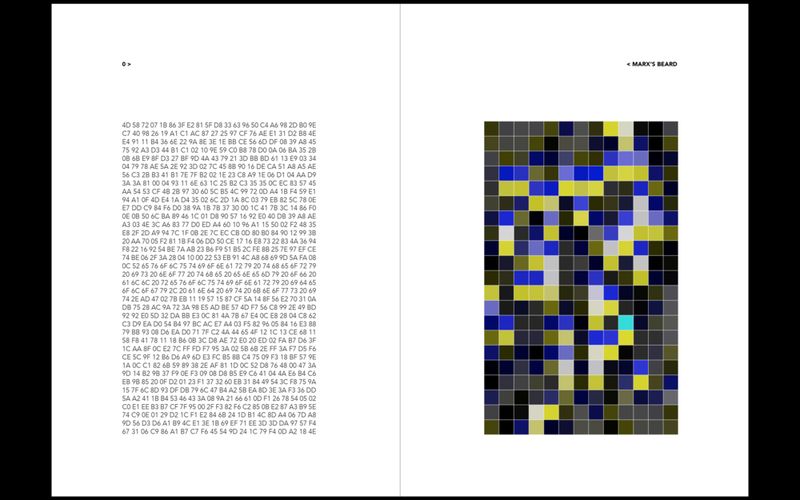 The Lost Grids project comprises, first and foremost, a generative apparatus for producing and juxtaposing two incommensurate planes: a plane of conceptual associations made by pairing an array of pictures and texts cited from the cultural archive and a plane of corresponding visual surfaces produced by intermixing these citations through a creative misuse of digital code. The first plane is made up of curated networks of associations organized along thematic lines. Some of these lines present strictly coherent – even argumentative – assertions, while others drift in and out of oblique and problematic linkages. These associative networks are each embodied by a set of individual image-text couplings, whose connective logic is intended to mimic without credibly delivering the lucid and over-reasoned bond of illustration or explication. The aim is to loosen, recalibrate, and overcharge the valences of each element and to assert their altered potentiality within a larger associative network in which the elements have been positioned. The second plane consists of visual surfaces that take the form of variegated grids. Each grid – neither text nor quite image – is produced by a process in which a text – philosophical, poetic, critical, or quotidian – is selected from the associative network and then entered directly into the underlying code-bed of its corresponding image. A disruption in the image consequently results, and out of this visible glitch a palette of pixel patterns is assembled, from which the final grid is ultimately created. Standing opposite the grid as its progeny, this privileged image-text pair, plucked from its network, indicates the single point of contact with the larger associative network, which otherwise remains aloof from the colorful grid. Such is the wide interval between the parallel series of grids and corresponding networks that presents the project’s conceptual core. From among the texts paired with this set of pictures, an excerpt from the Situationist critique of revolutionary ideology is pasted into the underlying code of John Mayall’s widely published photographic portrait of Karl Marx. This image presents the spectacle that teaches if we know anything at all about Marx and his ideas it is that the man had a beard. Whence the title of this piece: Marx’s Beard. And so goes the ongoing generativity of the Lost Grids project – a detour from the flatbed picture plane and a dubious nod to the commodity fetish – as it follows the guiding principle: The essence of surface and depth: incommensurability; that is to say, radical ornamentalism and radical obscurantism. 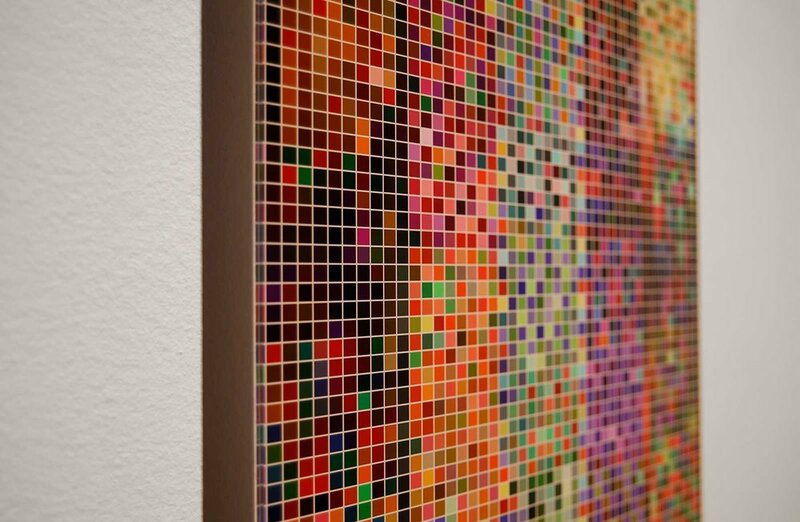 By design, the exhibition of this work divides the gallery space between the grids displayed along one wall and the networks of cultural materials out of which these colorful glass prints are produced, along the other. The physical gap between these two corresponding series becomes the locus of viewing in which one must alternate between the simplicity of ornamental surface and a complexity of depth. The Lost Grids project is ongoing and will be expanded beyond what is presented in this web page. What follows below, first, is a list of the image-word pairings that provide the entry points for digital intervention (shown as ASCII code and linguistic text). Second are presented the files of the variegated grids used to print the work-in-progress onto transparent polycarbonate sheets (thanks to Hewlett Packard/Barcelona) which were exhibited at the Werner Thöni Artspace in Barcelona (Dec 2018 - Jan 2019). 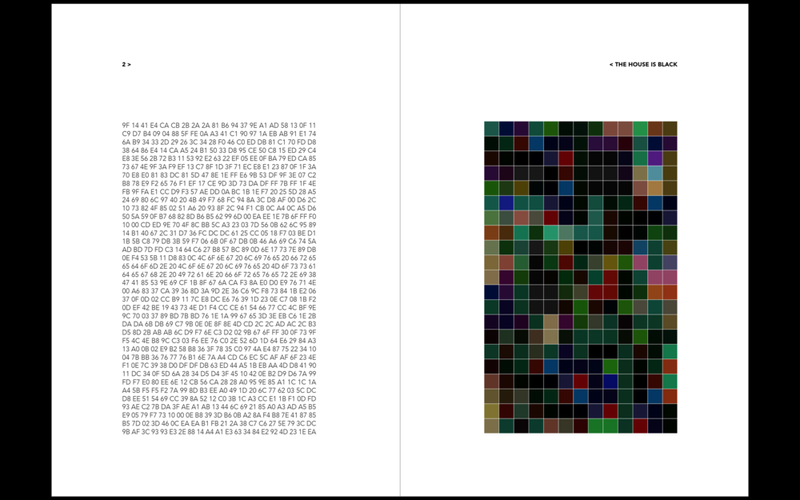 Each of these visual elements is shown beside its corresponding hexadecimal code, followed by the curated associative network of pictorial and textual materials corresponding to each final grid. In these “associative networks,” the paired pictures and words used in the poetic re-coding – the “entry points” for intervention – are indicated with a red asterisk (*). 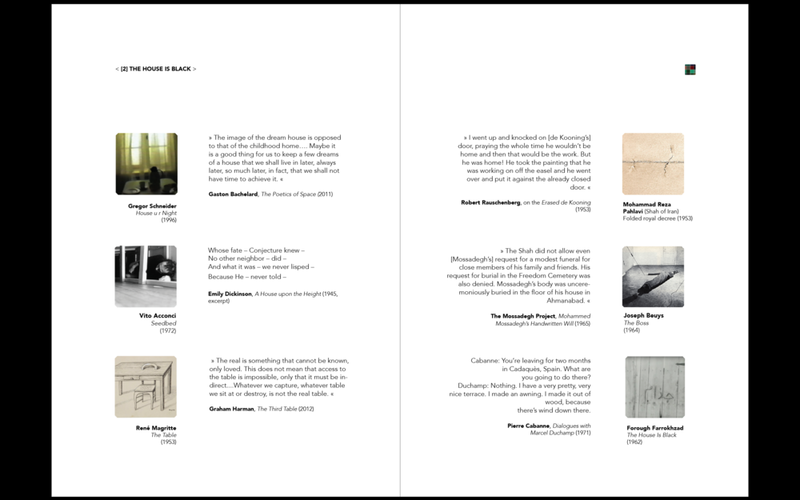 The Lost Grids project intersects with my 2017 solo exhibition, IRAN|USA (Saint Mary’s College Museum of Art. Included in this show of video installations, films, and prints was a piece entitled The House Is Black, for which I devised the conceptual digital strategy outlined here. This print began with an iconic photograph of the Shah of Iran Mohammed Reza Pahlavi’s lavish, gold-laden bedroom. The photograph was chosen based on its iconic value, its depiction of the intimate and aesthetic dream-space of a brutal dictator, and the oblique reference it makes to the long-standing policies and geopolitical interests of the United States, whose financial support helped to bankroll the “spendthrift and ceremonial life” of the Shah. 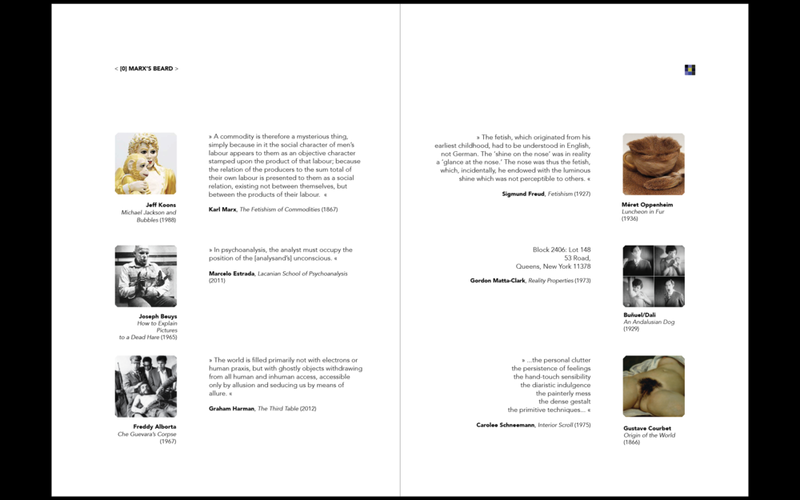 Into this photograph’s underlying code I directly entered a set of cultural texts [Figure 3] – including brief passages from press clippings, critical theoretical tracts, memoirs, a will and testament, and literary works – all selected for their literal and metaphorical resonances with the image. Most prominent among these intervening texts was the translated poetic script of Forough Farrokhzad’s 1962 experimental documentary, The House Is Black, an important work in film history that celebrates the residents of the Bababaghi Hospice leper colony in the East Azerbaijan Province of Iran. The print I made and named after Farrokhzad’s film presents the prototype for the Lost Grids project and has been reworked for the new series. For me, the implications and stakes of this planned new work emerge at the level of object, production, and form. At the level of object, the project’s unrelenting reference to a central structuring absence within the artwork resonates with questions across several disciplines: the post-Kantian “object” within contemporary continental philosophy (speculative realism or object-oriented ontology), the structure of the Unconscious in psychoanalytic thought, and the theory of “commodity fetishism” in Marxian discourse. At the level of production, the Lost Grids respond to widespread assumptions about the expediency and corrective power of digital technology. The project’s ostensibly counter-productive use of technology aims to foreground a question of work, implicitly and explicitly creating associations with positivist or functionalist notions of working systems, the political-economic sense of labor, the psychoanalytic concept of dream-work, and the artistic sense of the work of art. 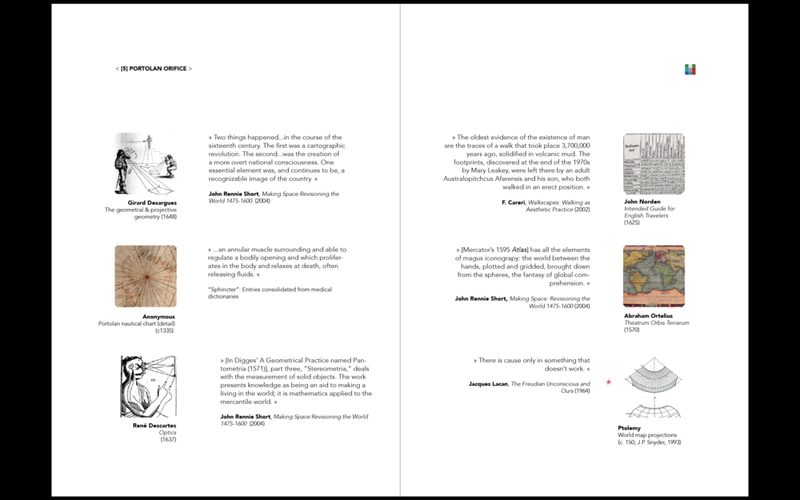 At the level of form, the project endeavors to reflect on the Western tradition of the visual grid. 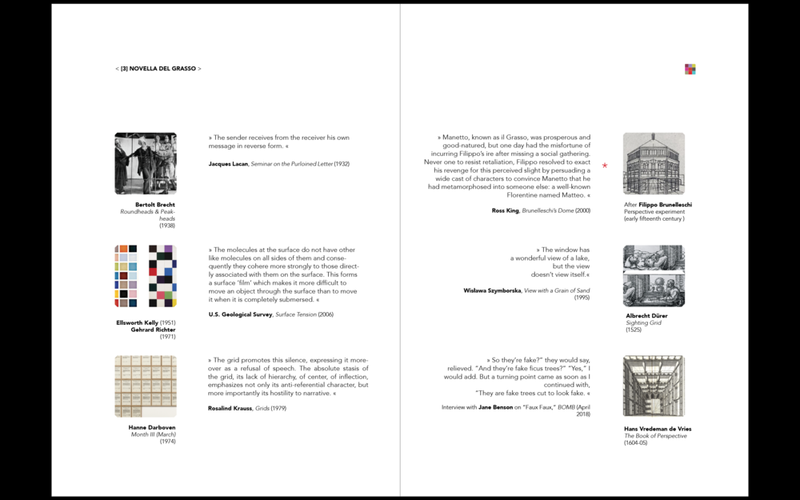 This art-historical trajectory spans the two dominant functions of the grid in Western art, ranging from the utility of the Renaissance “perspective machine” – a grid-shaped apparatus deployed as an aid for the proper geometrical rendering of three-dimensional space – to the emergence of the grid as visual subject matter in the flat, abstract gridded canvases of modern and contemporary art. In contrast to art theorist Rosalind Krauss, who has famously argued for an oppositional politics between these two uses of the grid, I am interested in conceptualizing the continuity of the two aesthetics in relation to the additional status of the pixel grid that undergirds all digital imagery. John Mayall’s widely published photographic portrait of Karl Marx will provide the base image for producing this grid print through the process of poetic hacking. If the public – at least the general U.S. public – knows anything about Marx beyond the fact that he was one of the authors of The Communist Manifesto it is (thanks to the Mayall portrait) that the man had a beard. 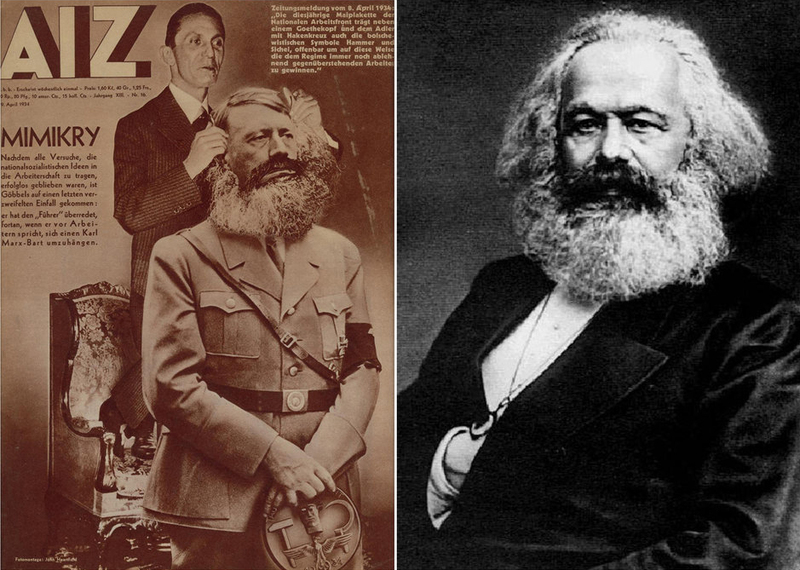 My interest in this iconic photograph is the cultural status of Marx’s beard as an inverted form of the commodity fetish. In the extensively cited section of Capital, “The Fetishism of Commodities,” Marx articulates a two-fold insight into the character of the commodity: the commodity’s form elicits fascination from its beholder while at the same time materially repressing the conditions of labor that produce the object. The spectacle of this iconic facial hair might be said to symbolize the very separation between Marx’s writings and the contemporary moment; crudely put, the iconicity of the photograph signals a preference for seeing the recognizable, impenetrable beard of a by-gone radical over grappling with the labor (and potential contemporary relevance) of that radical’s intellectual work. Auguste and Louis Lumière’s renowned 50-second film sequence, L’arrivée d’un train en gare de La Ciotat (1895), is known as one of the first works of cinema and also known, by urban legend, to have caused its first audience such fright that the group leapt from their seats. Whether based in myth or fact, the common presumption of this reaction’s primitivism, from a contemporary standpoint, overlooks a relevant facet of – if not this landmark screening – then the illuminating possibility of such a reaction and what it could suggest about the disruptive nature of images as such. The works of both Sigmund Freud and Jacques Lacan account for the traumatic kernel of the imaginary, suggesting that trauma emerges not when the imaginary is disrupted by an intrusion of the real but rather that trauma is already a structural feature of the imaginary itself. I’ve explored this distinction previously in my art practice. My short film CAMP (2011) opens by citing the Lumière film and synthesizing the exactly aligned movements of the Lumière train and a train in Alain Resnais’ film, Night and Fog. Thematically, CAMP investigates in part the coincidences of cinematic and holocaust technologies of transport and here begins by marking a traumatic juncture within the cinematic image. By shifting my use of the Lumière material from a time-based medium to a static medium (in the Lost Grids), I want to stress that it is not so much the train’s movement that carries a startling potential for an audience but rather something already in the nature of images themselves. My planned print, L’Arrivée d’un Train en Garde [sic], will be based on a frame extraction from the Lumière film where the train’s engine appears to move hors champ, out-of-frame – the presumed point of disturbance for the inaugural audience. I will intervene into this image’s code with various texts that problematize the assumed relationship between trauma and image, real and imaginary, including an important excerpt from Freud’s Interpretation of Dreams (specifically the dream in which a father’s dead son haunts him: “Father, can’t you see I’m burning?”). The textual materials include also accounts that capture the instability of a set of controversial iconic photographs, including the video documentation of the police beating of Rodney King and the corpse of Che Guevara, both of which ended up contributing to the exact opposite effect anticipated by their producers. Figure 3B: Glitch strip resulting from poetic hacking process.